Fishing trips are for kids, too. Lucky Chucky Charters now offers a special two-hour catch and release trip for kids so they can learn the fundamentals of fishing. This is an educational trip designed just for the younger set. They’ll fish and learn about everything from equipment, to the boat to the kinds of fish they may catch. And all the while, your little fishermen (and girls) will be having the time of their lives. If you’re looking for something fun to do with your sons or daughters, contact Lucky Chucky Charters and get onboard with Captain Chuck Kemper. Captain Chuck has decades of fishing experience in our beautiful bays and Gulf waters. You don’t need to bring anything with you because Lucky Chucky Charters will provide everything you need for an entertaining and educational trip. Be sure to bring a camera to record the fun the kids will have. And don’t forget hats, sunglasses and sunscreen for everyone. 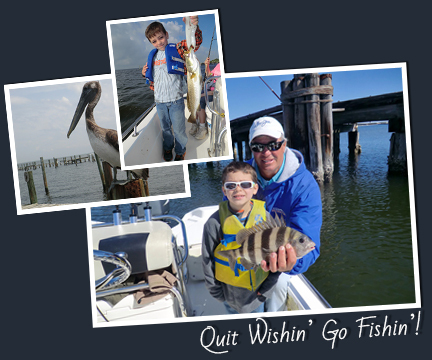 Contact us for more information on Kid’s Fishing Trips! Please contact us to book your trip!